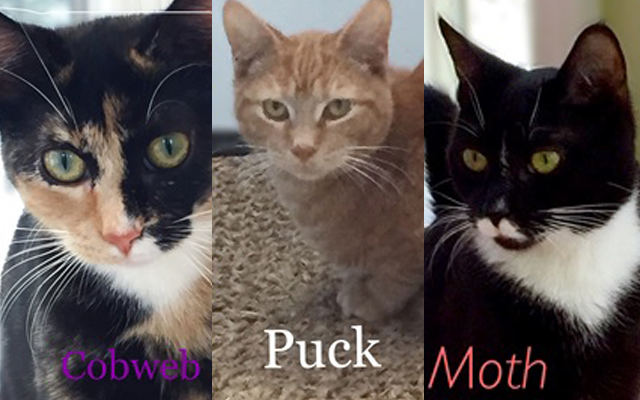 PAWS Animal Welfare Shelter presents Puck, Cobweb and Moth as Pets of the Week. These three siblings came from a feral cat colony when they were young. Now at 6 months, Cobweb and Moth have gotten used to humans and like being petted. All three love playing with Ping Pong balls. Puck is still a bit shy and likes to hide, but take out the laser pointer or feather toy and you will make friends for life. All three get along well with other cats and can be adopted separately. They are fixed, up to date on their vaccinations and cleared of any parasites. To see them, visit Valley Cat Haven during open hours Saturday from 11 a.m. to 1 p.m., Tuesday 1 p.m. to 3 p.m., or call Jean at 543-7348 for an appointment.